Calling the U.S. coup being sponsored in Venezuela a defense of democracy reveals the Doublethink underlying U.S. foreign policy. It defines “democracy” to mean supporting U.S. foreign policy, pursuing neoliberal privatization of public infrastructure, dismantling government regulation and following the direction of U.S.-dominated global institutions, from the IMF and World Bank to NATO. For decades, the resulting foreign wars, domestic austerity programs and military interventions have brought more violence, not democracy. In the Devil’s Dictionary that U.S. diplomats are taught to use as their “Elements of Style” guidelines for Doublethink, a “democratic” country is one that follows U.S. leadership and opens its economy to U.S. investment, and IMF- and World Bank-sponsored privatization. The Ukraine is deemed democratic, along with Saudi Arabia, Israel and other countries that act as U.S. financial and military protectorates and are willing to treat America’s enemies as theirs too. A point had to come where this policy collided with the self-interest of other nations, finally breaking through the public relations rhetoric of empire. Other countries are proceeding to de-dollarize and replace what U.S. diplomacy calls “internationalism” (meaning U.S. nationalism imposed on the rest of the world) with their own national self-interest. This trajectory could be seen 50 years ago (I described it in Super Imperialism  and Global Fracture .) It had to happen. But nobody thought that the end would come in quite the way that it is happening. History has turned into comedy, or at least irony as its dialectical path unfolds. 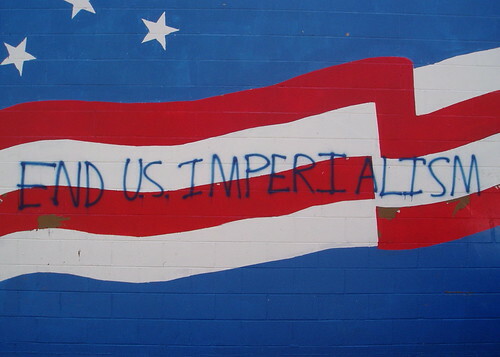 For the past half-century, U.S. strategists, the State Department and National Endowment for Democracy (NED) worried that opposition to U.S. financial imperialism would come from left-wing parties. It therefore spent enormous resources manipulating parties that called themselves socialist (Tony Blair’s British Labour Party, France’s Socialist Party, Germany’s Social Democrats, etc.) to adopt neoliberal policies that were the diametric opposite to what social democracy meant a century ago. But U.S. political planners and Great Wurlitzer organists neglected the right wing, imagining that it would instinctively support U.S. thuggishness. The reality is that right-wing parties want to get elected, and populist nationalism is today’s road to election victory in Europe and other countries just as it was for Donald Trump in 2016. Trump’s agenda may really be to break up the American Empire, using the old Uncle Sucker isolationist rhetoric of half a century ago. He certainly is going for the Empire’s most vital organs. But is he a witting anti-American agent? He might as well be – but it would be a false mental leap to use “cui bono” to assume that he is a witting agent. Here’s the first legal contradiction in U.S. global diplomacy: The United States always has resisted letting any other country have any voice in U.S. domestic policies, law-making or diplomacy. That is what makes America “the exceptional nation.” But for seventy years its’ diplomats have pretended that its’ superior judgment promoted a peaceful world (as the Roman Empire claimed to be), which let other countries share in prosperity and rising living standards. At the United Nations, U.S. diplomats insisted on veto power. At the World Bank and IMF they also made sure that their equity share was large enough to give them veto power over any loan or other policy. Without such power, the United States would not join any international organization. Yet at the same time, it depicted its’ nationalism as protecting globalization and internationalism. It was all a euphemism for what really was unilateral U.S. decision-making. Inevitably, U.S. nationalism had to break up the mirage of One World internationalism, and with it any thought of an international court. Without veto power over the judges, the U.S. never accepted the authority of any court, in particular the United Nations’ International Court in The Hague. Recently that court undertook an investigation into U.S. war crimes in Afghanistan, from its torture policies to bombing of civilian targets such as hospitals, weddings and infrastructure. “That investigation ultimately found ‘a reasonable basis to believe that war crimes and crimes against humanity” occurred. The original inspiration of the Court – to use the Nuremburg laws that were applied against German Nazis to bring similar prosecution against any country or officials found guilty of committing war crimes – had already fallen into disuse with the failure to indict the authors of the Chilean coup, Iran-Contra or the U.S. invasion of Iraq for war crimes. Central banks have long held their gold and other monetary reserves in the United States and London. Back in 1945 this seemed reasonable, because the New York Federal Reserve Bank (in whose basement foreign central bank gold was kept) was militarily safe, and because the London Gold Pool was the vehicle by which the U.S. Treasury kept the dollar “as good as gold” at $35 an ounce. Foreign reserves over and above gold were kept in the form of U.S. Treasury securities, to be bought and sold on the New York and London foreign-exchange markets to stabilize exchange rates. Most foreign loans to governments were denominated in U.S. dollars, so Wall Street banks were normally named as paying agents. But then came Venezuela. Desperate to spend its gold reserves to provide imports for its economy devastated by U.S. sanctions – a crisis that U.S. diplomats blame on “socialism,” not on U.S. political attempts to “make the economy scream” (as Nixon officials said of Chile under Salvador Allende) – in December 2018 Venezuela directed the Bank of England to transfer some of its $11 billion in gold held in its vaults. This was just like a bank depositor would expect a bank to pay a check that the depositor had written. This led to rumors that Venezuela was selling 20 tons of gold via a Russian Boeing 777 – some $840 million. The money probably would have ended up paying Russian and Chinese bondholders as well as buying food to relieve the local famine. Russia denied this report, but Reuters has confirmed that Venezuela sold 3 tons of a planned 29 tones of gold to the United Arab Emirates, with another 15 tones to be shipped on Friday, February 1. The U.S. Senate’s Batista-Cuban hardliner Rubio accused this of being “theft,” as if feeding the people to alleviate the U.S.-sponsored crisis was a crime against U.S. diplomatic leverage. If there is any country that U.S. diplomats hate more than a recalcitrant Latin American country, it is Iran. President Trump’s breaking of the 2015 nuclear agreements negotiated by European and Obama Administration diplomats has escalated to the point of threatening Germany and other European countries with punitive sanctions if they do not also break the agreements they have signed. Coming on top of U.S. opposition to German and other European importing of Russian gas, the U.S. threat finally prompted Europe to find a way to defend itself. On January 31 the dam broke with the announcement that Europe had created its own bypass payments system for use with Iran and other countries targeted by U.S. diplomats. Germany, France and even the U.S. poodle Britain joined to create INSTEX — Instrument in Support of Trade Exchanges. The promise is that this will be used only for “humanitarian” aid to save Iran from a U.S.-sponsored Venezuela-type devastation. But in view of increasingly passionate U.S. opposition to the Nord Stream pipeline to carry Russian gas, this alternative bank clearing system will be ready and able to become operative if the United States tries to direct a sanctions attack on Europe. I have just returned from Germany and seen a remarkable split between that nation’s industrialists and their political leadership. For years, major companies have seen Russia as a natural market, a complementary economy needing to modernize its manufacturing and able to supply Europe with natural gas and other raw materials. America’s New Cold War stance is trying to block this commercial complementarity. Warning Europe against “dependence” on low-price Russian gas, it has offered to sell high-priced LNG from the United States (via port facilities that do not yet exist in anywhere near the volume required). President Trump also is insisting that NATO members spend a full 2 percent of their GDP on arms – preferably bought from the United States, not from German or French merchants of death. The U.S. overplaying its position is leading to the Mackinder-Kissinger-Brzezinski Eurasian nightmare that I mentioned above. In addition to driving Russia and China together, U.S. diplomacy is adding Europe to the heartland, independent of U.S. ability to bully into the state of dependency toward which American diplomacy has aimed to achieve since 1945. The World Bank, for instance, traditionally has been headed by a U.S. Secretary of Defense. Its steady policy since its inception is to provide loans for countries to devote their land to export crops instead of giving priority to feeding themselves. That is why its loans are only in foreign currency, not in the domestic currency needed to provide price supports and agricultural extension services such as have made U.S. agriculture so productive. By following U.S. advice, countries have left themselves open to food blackmail – sanctions against providing them with grain and other food, in case they step out of line with U.S. diplomatic demands. It is worthwhile to note that our global imposition of the mythical “efficiencies” of forcing Latin American countries to become plantations for export crops like coffee and bananas rather than growing their own wheat and corn has failed catastrophically to deliver better lives, especially for those living in Central America. The “spread” between the export crops and cheaper food imports from the U.S. that was supposed to materialize for countries following our playbook failed miserably – witness the caravans and refugees across Mexico. Of course, our backing of the most brutal military dictators and crime lords has not helped either. Likewise, the IMF has been forced to admit that its basic guidelines were fictitious from the beginning. A central core has been to enforce payment of official inter-government debt by withholding IMF credit from countries under default. This rule was instituted at a time when most official inter-government debt was owed to the United States. But a few years ago Ukraine defaulted on $3 billion owed to Russia. The IMF said, in effect, that Ukraine and other countries did not have to pay Russia or any other country deemed to be acting too independently of the United States. The IMF has been extending credit to the bottomless pit of Ukrainian corruption to encourage its anti-Russian policy rather than standing up for the principle that inter-government debts must be paid. Where is the left in all this? That is the question with which I opened this article. How remarkable it is that it is only right-wing parties, Alternative for Deutschland (AFD), or Marine le Pen’s French nationalists and those of other countries that are opposing NATO militarization and seeking to revive trade and economic links with the rest of Eurasia. The end of our monetary imperialism, about which I first wrote in 1972 in Super Imperialism, stuns even an informed observer like me. It took a colossal level of arrogance, short-sightedness and lawlessness to hasten its decline — something that only crazed Neocons like John Bolton, Elliot Abrams and Mike Pompeo could deliver for Donald Trump. “It Can’t be Fixed: Senior ICC Judge Quits in Protest of US, Turkish Meddling,” January 31, 2019. Patricia Laya, Ethan Bronner and Tim Ross, “Maduro Stymied in Bid to Pull $1.2 Billion of Gold From U.K.,” Bloomberg, January 25, 2019. Anticipating just such a double-cross, President Chavez acted already in 2011 to repatriate 160 tons of gold to Caracas from the United States and Europe. Corina Pons, Mayela Armas, “Exclusive: Venezuela plans to fly central bank gold reserves to UAE – source,” Reuters, January 31, 2019. Constanze Stelzenmüller, “America’s policy on Europe takes a nationalist turn,” Financial Times, January 31, 2019. Michael Hudson is President of The Institute for the Study of Long-Term Economic Trends (ISLET), a Wall Street Financial Analyst, Distinguished Research Professor of Economics at the University of Missouri, Kansas City and author of …and forgive them their debts, J is for Junk Economics (2017), Killing the Host (2015), The Bubble and Beyond (2012), Super Imperialism: The Economic Strategy of American Empire (1968 & 2003), Trade, Development and Foreign Debt: A History of Theories of Polarization v. Convergence in the World Economy (1992 & 2009) and of The Myth of Aid (1971), amongst many others. He can be reached via his website Michael Hudson, mh@michael-hudson.com. This entry was posted in Capitalism, Economy, Imperialism, Venezuela, War Crimes and tagged Coup d'état, Donald Trump, Economic Warfare, Gold, Juan Guaido, Michael Hudson, Nicolas Maduro, Same As It Ever Was, Sanctions, Very Important or Must-Read Posts. Bookmark the permalink. I found this article to be clear and informative. I can believe that the US empire is unravelling, but I don’t believe that the US will be replaced by some other world power and I certainly don’t believe that any of the other major powers are more decent than the US. The US is a bigger mess. What do we do to fix this mess? It’s one big soap opera. Any answers to clean this up? The word ‘brilliant’ here is meant entirely ironically. Unfortunately with all the chickens coming home to roost, I and millions of other people residing by accident of birth, in the heart of the evil empire of greed will suffer when the system collapses from the imperial hubris and overreach this perceptive piece describes. Thank you, Amy, very well stated. Another excellent analysis by Michael Hudson. I have also been watching all of these developments, and although I haven’t come to quite the same conclusion, I do think that 2019 is a pivotal year in matters of finance. What I think is going to happen is that the next stock market crash, which will probably happen either late this year or early next year, is one that the U.S. will never come out of, at least not any time soon. Other countries will seize the opportunity to separate themselves from the U.S. dollar (greatly reduce their foreign currency reserve denominated in U.S. dollars), and the U.S. will no longer have endless credit as it has since the Bretton Woods agreement which made the U.S. dollar the leading foreign currency reserve after WWII. Thanks, peacevisionary, always good to hear from you. Hope you’ve been well. Sounds like good news but will have to read it more carefully to see if it makes sense. Thanks, Cameron. It’s a very good article/essay, hope you’ll read all of it thoroughly.